Here is a photo of the quilt that inspired my quilt. It's easier to see the pattern on this photo. I cut 8.5" squares of the Marimekko scraps and two white pieces (3.5"x 8.5" and 3.5"x 11.5") for each block. 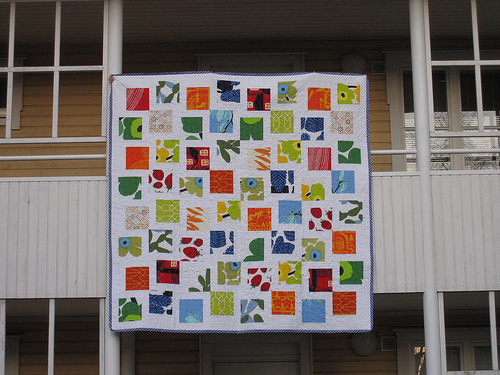 The blocks finished at 11" square when the quilt was assembled. Then you just rotate them to get the desired effect. The borders were also 3.5" wide. The king size quilt was 106" x 117", 9 blocks by 10 blocks. Thanks for your kind comments.